Training, lessons and clinics - "Here I am, Rock you like a..."
"Here I am, Rock you like a..."
Hurricane is a professional equestrian with over 18 years of experience, specializing in building confidence in both horse and rider across many disciplines. Want to learn how to make your cross country time more efficient? Or learn how to enjoy a safe gallop? 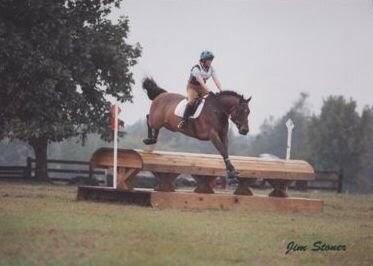 From beginners learning to ride to Olympic dreams (yes, Destination Known was on the US development team! ), Hurricane has helped horses and students realize their full potential. Read Hurricane's professional equestrian resume. To see Hurricane's training calendar and learn about Blue Sky Farm. For availability, location and prices, please contact Hurricane.